Situated on an ancient trade road, the former independent administrative unit and ecclesiastical seat of Spišská Kapitula (Spiš Chapter) is spread out on the hill known as Martinský kopec opposite Spiš Castle. Today, it is joined with the town of Spišské Podhradie. Spišská Kapitula continues to be the seat of the church administration and a seminary today. Tourist accommodation is also offered there. According to the first written mention, Spišská Kapitula was in possession of the first known Spiš provost Adolf. 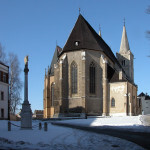 When it later became the centre of church administration, its powers reached from Šariš to Liptov. Archaeological research testified to the settlement of the site in the 11th century. Remnants of a rotunda were uncovered north west of the cathedral. Remnants of a 9th-century monastery and shelter, believed to have been a Benedictine house devoted to St Martin had been found to the west. The dominant feature of the built-up area today is the Cathedral of St Martin with its two stately towers, which was built in place of an older chapel devoted to St Andreas. The construction of this cathedral began in the Romanesque period and it has indicated that it was originally a single-nave building, according to the most recent research quite unique for our area, with a transept and until today unknown westwork. These latest findings highlight the close cultural contacts of the then area of Spiš with Germany. The latest findings have also shown that in the 12th century, one part of the westwork premises probably served as a private chapel of the royal family. They started building it in the Romanesque period. Its reconstruction in the Gothic style began in 1433 when the main nave was vaulted over with a reticulated vault. The burial chapel inspired by the elegant Paris Saint Chapelle was built in place of the original northern Chapel of Corpus Christi by the Zápoľský family. By the end of the 15th century members of this family had become hereditary counts of Spiš. The church became the Bishop´s Cathedral in 1776, leading to its modernisation. Purist Neo-Romanesque modifications were made in the period from 1873-1889. Despite these changes, the Cathedral’s extraordinarily valuable interior and especially the 15th-century Gothic altars have been preserved. The oldest known Romanesque sculpture in Slovakia, called Leo Albus, is placed here. This sculpture was originally part of the Romanesque entrance. In the 14th century the central part of the town and Cathedral was surrounded by walls and by the end of the 16th century a tower gateway had been added to the western side. The entire ecclesiastic town was enclosed with walls between 1662 and 1665. The walls with their loopholes were strengthened by adding circular or semicircular bastions, although those facing Spišské Podhradie at both corners were polygonal. Houses in the town were built in one row alongside the only street connecting the Lower and Upper Gates. The number of houses was fixed at about 30 throughout its long-term development. Originally the houses were inhabited by members of the chapter and their servants. The Bishop’s Palace is the second most important building in the town. The former Provost’s Palace, dating from the early 13th century, was enlarged in the 15th century. The most extensive reconstruction in Baroque style took place between 1652 and 1656. During this period the charming Clock Tower was built to form an entrance into the garden. The furnishings of the palace interiors in the Art Noveau style are also noteworthy. The final spacious building of the seat is the Priest´s Seminary, which consists of two connected structures, the teacher’s institute and the former seminary. The school was founded by Jesuits on a piece of land where a former inn stood. They obtained the land as a gift in 1646. After the abolition of the Jesuit order, the school became the possession of the newly established bishopric. The seminary was rebuilt in the early 19th century. Its current appearance is the result of an overlarge superstructure created in the 1930s. Most of the canonists´ houses are originally Gothic two-storey buildings which were later adapted in Renaissance and Baroque style. In the front section was the canonist residence standing opposite the servants’ quarters. Both buildings were connected by a wall with entry gates for pedestrians and vehicles. At the back of the garden there were farm buildings and granaries. 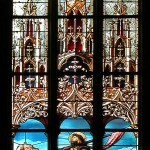 The canonries have preserved valuable Renaissance elements and details, though they mostly acquired a Baroque appearance. The town was declared a Town Conservation Reservation in 1950. The intact complex of monuments preserved together with Spiš Castle and its connection with cultural landscape were one of the main reasons for the entry of the unique complex of Spiš Castle and monuments in its surroundings on the list of the UNESCO World Cultural Heritage in 1993.